The edit screen defaults to a single column layout, but this can be changed to multi-column under “Screen Options” at the top right of the page. These are found at the top of the edit screen next to the Invoice subject field and descriptions are shown on hover. 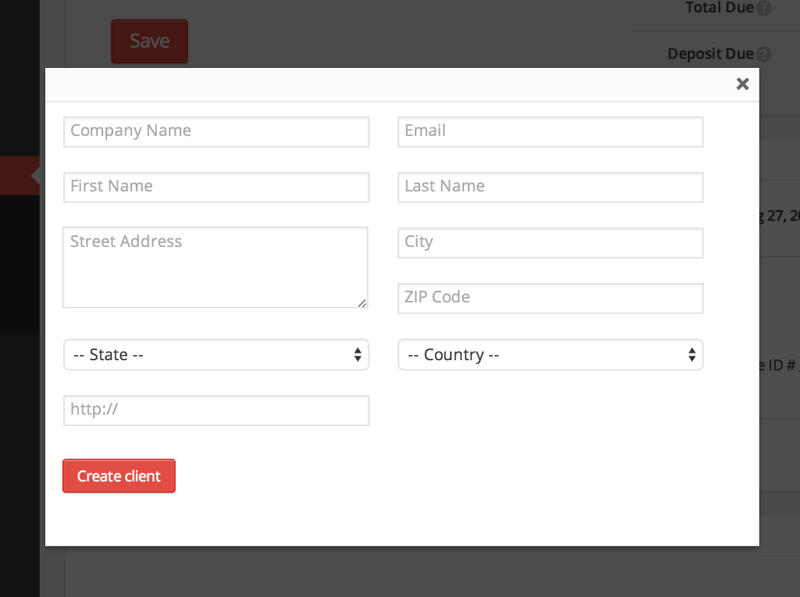 For the free version of this plugin, the quick links are located in a drop-down menu next to the Invoice subject field. Each line item has a description, rate, quantity and discount field. The rate field accepts negative values and could be used for non-percentage based pricing adjustments, and the discount field accepts negative values and could be used as a method to add tax. Add new line items with the Add button. 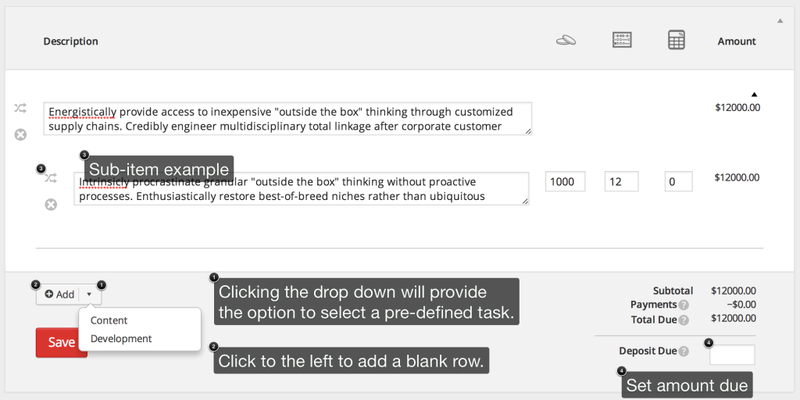 The add button will have a drop-down option if you have any pre-defined line items. The Deposit field sets the payment due date. It’s a method that sets the deposit for an invoice, or simply adjusts the total amount that the client needs to pay. Once a deposit payment is paid, the value is removed and the payment total due is now the remaining balance. Check the marketplace for add-ons that improve this functionality by adding payment terms. The invoice history shows all the events concerning the current invoice, including status updates, notifications, client views, and more. Additionally, there is a text area at the bottom of the history section for private notes. You can add a project, status, or any other information that you don’t want the client to see. Sending an invoice from the edit screen can be done in two different ways: Quick Send or by selecting a Recipient and updating the invoice. The quick send will send the notification in the background, but requires any edits to the invoice to be saved first (unless the information isn’t critical to the estimate notification being sent). 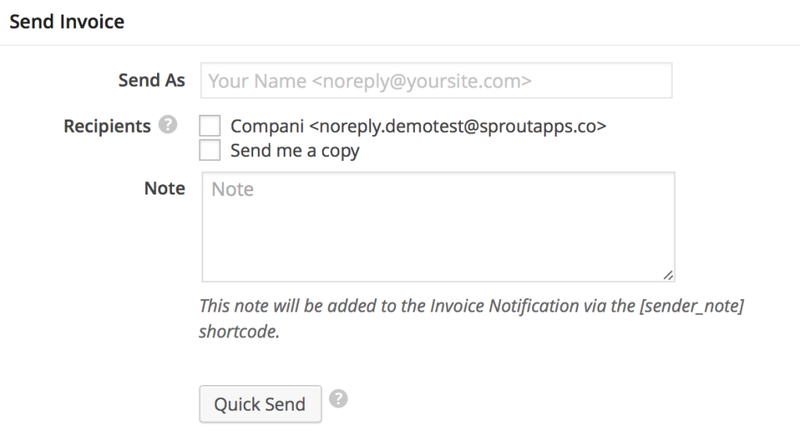 The Note field is used for the [sender_note] shortcode. If you don’t need to add a note, leave this blank and the shortcode will return nothing. There are many ways to use the [sender_note] shortcode. A popular method is to let your client know about any changes you made to the invoice; another method is to add a personal note for the client to increase engagement. Sending a copy to yourself first is a great way to test out what your client will see on the invoice before you send it out.